The late Crispin Aubrey’s research material has now been donated to the Statewatch archive, and is in the process of being digitised. It seems a good time, therefore, to provide a brief account about my own small effort to shine a light into the murkier corners of 1970s official secrecy. One Sunday lunchtime in the early summer of 1976 I went to a party in Hampstead, where I met a young Scottish woman called Aggie MacKenzie. We chatted for a while and then a few hours later I gave her and a friend a lift into town in my old Austin A40, dropping them off at a bus stop before heading home to my rented flat in not at all trendy Stoke Newington. Somehow, I had acquired her phone number and a few days later I plucked up enough courage to ring her. We began our relationship shortly after that: she shared a house in Stockwell with several other young women who worked with her in, what she told me then, was the Foreign Office. I lived on my own, so we took to spending most nights together in my flat. Her housemates were all the kind of well-bred Home Counties types that you would have expected to be secretaries in the Foreign Office, but Ag was different. The year 1976 is famously remembered now for its long hot summer, but it was also the year in which the ‘George Davis is Innocent OK’ protest came to a triumphant end. Davis was a Londoner with a criminal past but he had been arrested and convicted for a crime he did not commit, after the police concocted a case against him. He was finally released from prison that summer under the royal prerogative. Living in east London I knew about this, but Ag knew more. Not long after arriving in London the previous autumn, she had been to the play about him which was then running at the Half Moon theatre and had even been on a subsequent demonstration demanding his release. When her bosses found out about this, she was warned never to go on a demonstration again, she told me. This was also the time when I was instrumental in getting the community newspaper Hackney People’s Press back into publication. I had become involved in HPP the previous year, when the main person in the publishing collective had been the Time Out journalist Crispin Aubrey. Crispin had dropped out of this in the autumn and it went into abeyance for a while. However, I got together with two or three other people and we had produced a modest eight page edition in April, with the aim of building up another group. A few more then came forward and Ag also began helping on the production weekends, her typing skills leading to an immediate improvement in the quality of the artwork. At that point I still thought that her job was in the ‘Permanent Under Secretary’s Department’ of the Foreign Office. It was not based in Whitehall, she said, but in an anonymous looking building next to Lambeth North tube station. However, a few months later she told me that this was a fiction: she was in fact working for MI6, or ‘the Service’ as it was known, and this office block was its head office, Century House. She said that she hadn’t known who her real employer was until the day she started, having been recruited straight from college in Aberdeen to work for the Foreign Office as a bilingual secretary. (She has written about this herself on a number of occasions over the last few years.) I should say at this point that I never asked her for any details of her work. There were a few times over the next couple of years when she mentioned things in passing, but we were both conscious of the fact that she had signed the Official Secrets Act, and all that entailed. My natural caution was exacerbated in November 1976 when the news broke that two American journalists, Philip Agee and Mark Hosenball, had been told that they were to be deported from the UK on the grounds of being threats to national security. Agee was an ex-CIA employee who had written a book about his time in the agency. Hosenball was a Time Out reporter who had written extensively about security matters in the magazine. My interest in this story was given added spice by the knowledge that Crispin was a colleague of Hosenball’s in the Time Out newsroom. Two months later, the lease on Ag’s Stockwell house ran out and we decided that she would move in with me. 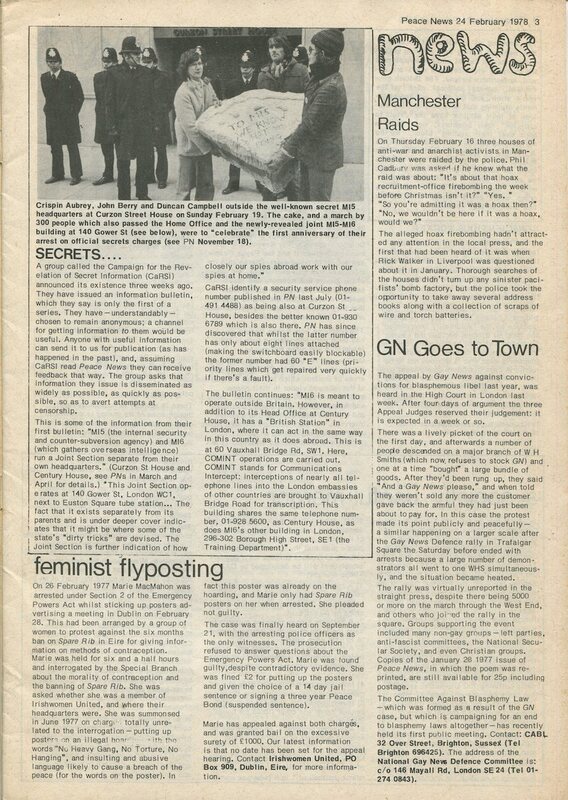 We had only been together in the flat for a few weeks when the news came that Crispin had himself been arrested, along with another journalist Duncan Campbell, after the pair had conducted an interview with a former soldier, John Berry, who had contacted the Agee/Hosenball Defence Campaign. The three were eventually charged with breaking the Official Secrets Act. An ABC Defence Campaign was set up immediately and I started going to its meetings. The people attending were a mixture of family members, friends and colleagues, lawyers and the usual oddballs who turn up when events like these are advertised publicly. Although the charges the three men faced were serious, there was an element of farce both in the way in which they had been arrested and the subsequent course taken by the prosecuting authorities, and a lot of the campaign’s activities therefore concentrated on ridicule and fun. I tried to make myself useful by doing artwork for posters and badges as well as turning up for various leafletting and picketting events. It was at one of these, a lunchtime protest outside the MI5 head office at Curzon Street House, that I suddenly became aware that a small window had opened behind my head and a camera lens was poking out. As soon as I turned to look at it, the lens was hastily withdrawn and the window closed. A few months later, in May 1977, Ag was sent by the Service on a residential course. Apparently this was standard procedure for secretarial staff, to prepare them for possible postings abroad. She didn’t tell me exactly what it would entail but I had read enough John le Carré novels to guess that it involved tradecraft and the like. The venue was somewhere referred to only as ‘the Fort’, and it was somewhere near Portsmouth. (In a sign of how things have changed since then, I now know that the site is in Gosport and is called Fort Monckton. The centre is even mentioned on the Fort’s Wikipedia page.) In preparation for the course, she had been told that she had to give her current address and phone number, so she listed ours. At this point in our relationship she hadn’t yet told her parents that she was living with a boyfriend, knowing that they wouldn’t approve. They thought that she had moved in with a female work colleague who, conveniently for her, wasn’t on the phone. However her sister, who lived in London, did know the truth. So I was surprised when, late one evening, the phone rang and a man with a middle class English accent asked to speak to ‘Aggie’. No, you can’t, I said, she’s away on a work course. I asked who was calling. He told me that he was a cousin, and that he was unexpectedly down in London and thought he would get in touch. I said that if he was a cousin, he presumably knew Ag’s sister’s number and that he should get in touch with her in the meantime. At this point, the man sounded confused and hung up. It then dawned on me that he was in fact some sort of spook checking up on the number, and seeing who answered. Also, I knew that no one in her family called her ‘Aggie’: to them she was always Agnes or Ag. When she came home at the end of the course, I told her and she immediately agreed that it must have been someone checking. I decided then that I should be even more careful about Ag’s real employer and not do anything to draw attention to it. However, over the year or so we had now known each other I had gleaned various bits of low level information from her which I thought it would be useful to share with the wider world. It wasn’t difficult to work out, for instance, exactly which was the building in North Gower Street which housed the headquarters of the MI5/MI6 joint station. It had no signage outside, a bomb-proof protruding ledge over the entrance doors, discreet security men sitting behind the reception desk and floor to ceiling net curtains in all the windows. 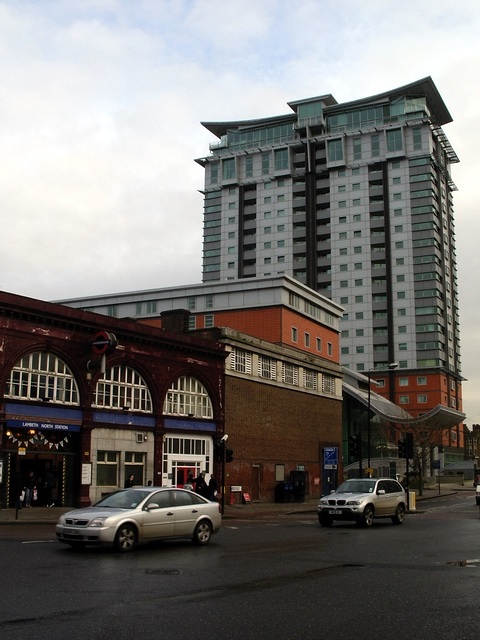 I learnt to recognise similar characteristics in London’s other ‘top secret’ buildings. By coincidence, a building in Borough High Street housing the MI6 Training Department was almost next door to my own place of work, the Folio Society’s offices in Great Suffolk Street. I would stroll casually past in my lunch break, noting how various plain vans could occasionally be seen reversing into its loading bay. I couldn’t just give this information directly to Crispin, or anyone else for that matter. If I did I would have to reveal Ag’s real employer and even though I could trust him not to pass on the information, it would probably leak out. So I decided that the best thing to do was send it out anonymously, although I would have to wait for an opportunity to do so. Ag went back home to Rothiemurchus, near Aviemore, for the Christmas and New Year holidays leaving me in London, and I realised that I then had time to act. I decided to create a bulletin from a new organisation which I called CaRSI, the Campaign for the Revelation of Secret Information. Producing the bulletin involved me adapting some of the tradecraft I had gleaned from all those spy novels. I had plenty of Letraset at home which I could have used to create the CaRSI letterhead but I realised that this would be easily traceable so I stayed late at work one day and photocopied the Bodoni Bold page – a type sheet I had never owned – from the Letraset catalogue on the office copier. I remember being quite pleased with the logo I designed using this photocopy, with its use of a lower case a in an otherwise all-cap setting, but I realised that I wouldn’t be able to claim ownership of it for a while. I pasted the logo up into a master page and then used the copier again to make some letterheads. The copier had a replaceable ‘blanket’ on which the original image was cast before transferring it to the copy, so I changed the blanket and threw the old one away after finishing the work. As I knew it would be some time before I posted out the letters, I reckoned the bin’s contents would be well on the way to landfill by then. I had spotted an office equipment shop in the Strand which had a sign in the window saying typewriters for hire, so I called in there and rented a portable typewriter for a week, paying cash and leaving a deposit. To be on the safe side, I gave the shop a false name and an address in west London. Everyone was much more trusting in those days. I typed up my information onto a single page of my letterheads, rather grandiosely calling it Bulletin No.1, and put it into a plain envelope. There was a self-service photocopier at Baker Street Tube station so I went there to make copies, taking care to wear gloves when handling them. I bought a sealed packet of envelopes and some stamps, and again wearing gloves while handling them, typed the names and addresses of various newsrooms onto a number of envelopes. I forget how many media outlets were on my list but it was probably about a dozen in all. These included Time Out, Peace News, The Leveller and various left papers. Then I put the bulletins into the envelopes, sealing them and sticking on first class stamps with a damp spongecloth, so not to leave saliva traces. I placed all the envelopes into another larger one before removing my gloves. Then I burnt all the leftover bulletins and the original master copy in the kitchen sink and flushed the ashes away. I put the typewriter away in its case, having first given it a thorough wipedown to remove any fingerprints from the keys and the carriage. I wiped down the outside of the typewriter case, took it back to the hire company and then dumped the rest of the envelopes in a public litter bin. I decided not to post the envelopes out while Ag was away: someone might spot this, I thought, and decide that this wasn’t a coincidence. So I sealed the larger envelope up and put it at the back of a desk drawer, reckoning that she wouldn’t find it there. One day, a few weeks later I decided that the time was right to post the bulletins off, and took the envelope with me to work. I went up to the West End on my way home and posted the individual envelopes, if my memory serves me correct, in a busy letterbox in Tottenham Court Road. Again, I wore gloves and dumped the outer envelope in a public bin. It’s now 42 years since my foray into the espionage world. Ag left her ‘Foreign Office’ job in 1978 and went to work in the press office of the National Union of Students. Shortly afterwards, I also started a new job, as the publications officer for what was then called the National Council for Civil Liberties (now just Liberty). Its dingy office in King’s Cross Road had also served as the headquarters of the Agee-Hosenball Defence Committee, and a tap on its phone had probably led to the arrest of the ABC defendants. The ABC case itself finished in November 1978 in pretty farcical circumstances with the three defendants being found guilty on three Official Secrets Act Section 2 charges, which was almost a technicality. Crispin and Duncan got conditional discharges, and John Berry a suspended sentence. Crispin Aubrey left a voluminous archive at the time of his sudden death in 2012. As his wife Sue said ‘Crispin never threw anything away.’ It has now been handed over to the Statewatch collection and is in the process of being catalogued. Somewhere in the two and half filing cabinets there may well be a copy of CaRSI’s one and only bulletin. I’m looking forward to seeing it again. The issue of Peace News which reported the CaRSI bulletin. (No 2064, 24 February 1978).